The trend for a lot of software companies in this age of freeware is to release their old versions for free. This lets potential users TechSmith is doing just that with their award winning products SnagIt & Camtasia. SnagIt is a Screen Capture and an Image Editing tool. It is really feature rich and you can check out all the features here. The current version as I write this post is 8.2 and the free license being given away is for version 7.2.5. If you are a Windows Vista user, you might have issues installing this version. You have the option of upgrading to the current version of $39.95 per copy. Camtasia is used to create stunning screen recording and editing. You can capture video of entire screen or just portions and record sounds as well. You can also edit the captured video and burn it to disc. Current version Camtasia Studio 5 is priced at $299 but you can get Camtasia Studio 3 for free right now. For a regular user, the free version should suffice and it would be nice step into a professional software even if it is a tad old. Update: Sorry about the misspelled title! It is Camtasia without the ‘s’. I use the free version (relatively older) of FastStone Capture for my screen capture and basic image editing needs. It is portable and has awesome features. But, I am about to give SnagIt and see what kind of difference a paid software offers against a free one. I almost forgot to mention the awesome Screengrab! 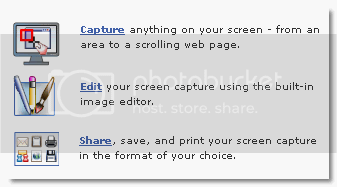 Firefox extension that makes taking whole screenshots or selection of webpages such a breeze. What do you use for your screenshot needs? Good news, also i used another cool free screen capture software is EasyCapture! Used Snagit for a really long time now and I LOVE it! If people aren’t sure, I recommend checking it out. I thought there must be a catch somewhere and there was. Imagine TechSmith giving away a 299 dollar software free (even if it was the older version). Actually, the Camtasia offer was for PCPlus readers alone and it got leaked to everyone else so now Techsmith have withdrawn the offer . the download link works but they wont send you a key anymore. Apparently even the free SnagIt was for a limited time. Benjy, thanks for the update. Sorry you couldn’t snag one when they were giving it out! Darn, sorry to see Camtasia no more offered free, we have the full copy at work and it is a good program. I am still using Microsoft Encoder which isn’t bad, but not as powerful as Camtasia. This was nice, but expired long ago. Most of the above links are broken, but you can find the software versions at oldversion.com if you want. A search might turn up some old software keys to go with your ole versions. Snagit seems to be up to 10.x now, and I think Camtasia is on about version 7.